Set of 10 A4 tabbed dividers. Mylar-coated dividers ideal for filing. Colour-coded tabs for easy co-ordination. Blank tabs for labels with colour-coded index page. Multi-punched to fit any standard folder or file. 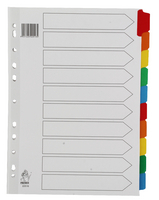 White dividers with multi-coloured tabs. Approx Dimensions (CM): D30.8 W22.8 H0.3. Approx Weight (KG):0.0791.